You'll find answers here to the questions that we are asked most frequently. But, if you don't see what you are looking for, please feel free to contact Customer Service. There are 3 easy ways to order. Click here for more information on how to place an order. How do I split an order to ship to multiple addresses? Shipping and returns questions are answered on our shipping and returns page. Click the button below for more information. To place an order from an international location, or to ship to an international location, please contact Customer Service. Selections from Museums of Canada. PO Box 1540, Niagara-on-the-Lake, ON, L0S1J0. Sorry no C.O.D. accepted. Please do not send cash in the mail. If you have questions about your order, we're here to help. Follow this link to contact Customer Service. You'll need to supply your order number and email address. If your email or address has changed after you've placed your order, fill out this form with your information changes, and we'll update your order. What is the best method of payment for purchased goods? We accept MasterCard, VISA, as well as cheques or money orders (made payable to Selections from Museums of Canada). How do I return or exchange goods? Questions about returns are answered on our shipping and returns page. Click the button below for more information. Shipping and handling questions are answered on our shipping and returns page. Click the button below for more information. When you shop and pay for your purchase at Selections from Museums of Canada online store you can be assured that your personal and payment information is handled with the highest degree of security and confidentiality. We use Secure Sockets Layer (SSL) payment technology that safely encrypts all of your private information when placing an order, and guarantees it is sent securely for processing. Your credit card account number is not stored on our website. How do I request a print version? Our latest print version is overflowing with fabulous new items... plus many of our best sellers from previous years! To receive your own copy, complete the form on the Request a Print Version page or contact us at 800-221-4443. Your print version will arrive in approximately 10-14 days. How do I send a friend Selections from Museums of Canada? If you would like us to send a friend or relative a FREE copy of Selections from Museums of Canadae simply provide us with their information on the Request a Print Version Page page or contact us at 800-221-4443. Their copy will arrive in approximately 10-14 days. We begin to process your order immediately after you submit your order. We pick, pack, wrap and ship your order as quickly as we can. We do not have the ability to change or stop orders once they have been placed. Instead of cancelling your order, simply return the product to us when you receive it using the Return Form included with your order. We will refund the original cost of the merchandise. For additional help, please speak with a customer service representative by calling toll-free 1-800-221-4443. Shipping questions are answered on our shipping and returns page. Click the button below for more information. If I don’t like the item I’ve purchased, can I return it? Yes! Returns questions are answered on our shipping and returns page. Click the button below for more information. Can I place an order and have it shipped to an international destination? No, unfortunately we cannot send food items to the United States. We endeavour to ensure that all items are in stock. Should an item not be available, we will advise you immediately while you are on the phone or via email. While placing on order on our website, out of stock items are clearly labeled as “Backordered.” No additional shipping charges will apply. What are the sizes of your clothing like? For both men's and women's clothing, we have standard Canadian sizes. Which products are made in Canada? Look for the 'Made in Canada' marker in the print version or on the product page on the website. Yes! 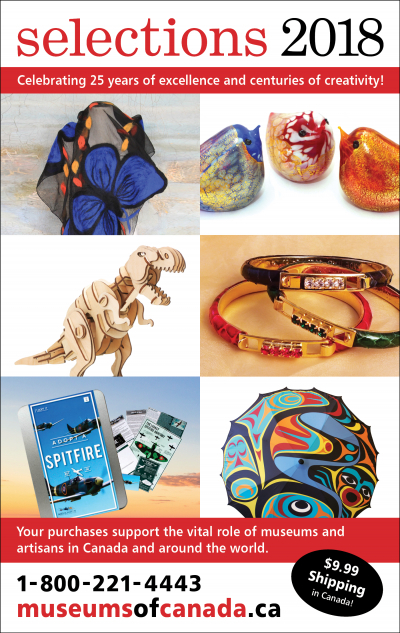 A gift certificate from museumsofcanada.com is the perfect choice when you are out of time or don't know what to give. Electronic gift certificates may be redeemed by calling the toll-free number 1-800-221-4443. Simply enter the Promotional Code on the Gift Certificate during the checkout process. Yes, all of our items may be gift wrapped for an additional fee of $6 per item. Please select the Gift Wrap Option on the product page. Are there special offers on any of your products? Look in the "Clearance" section on www.museumsofcanada.ca to find limited-quantity, first-quality products that we are discontinuing. ALL SALES are FINAL with items in this section. Does anything ever go on sale? Yes. We send emails "eblasts" to customers who having email addresses in their profile listing the different sales offered. Or you are welcome to call us at 800-221-4443 for additional information.